How does a Newton's Cradle work? 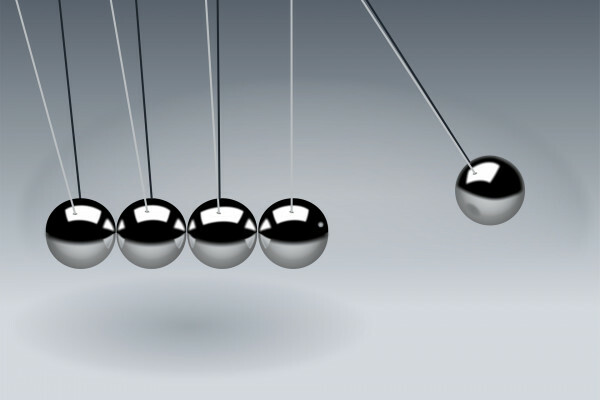 How does a Newton’s Cradle work? In school I was taught that the mass X velocity = mass X velocity. In other words, one ball in means one ball out. The teacher pulled back two balls and let go. The two balls at the other end of the contraption went up about the same distance as the first two balls. Why didn’t just one ball fly off at twice the speed? Dave - Newton's cradle is a whole series of collisions. You're taking a really bouncy metal ball, it's very hard steel ball and bouncing it into a row of them from one end and crashing into it. In this kind of collision there's two things which are conserved, which have the same amount at the end that you had at the beginning. One is kinetic energy that you were talking about before. That's 1/2 x mass x velocity squared. The other one's something called momentum which is your mass X velocity. You've got one ball dropping into it with a mass and a velocity you will have the same mass and velocity by having one ball coming out with the same energy and the same momentum. With two balls with the same amount of energy then they'd actually be moving less than half the speed. So they'd have less than the same amount of momentum you'd put in. The only solution is to have the same amount of balls coming out as went in. Chris - Is it not also that there's a little tiny delay between one ball hitting and the next ball hitting? The same when you get two separate collisions throwing off two separate balls. When you go two balls in you get two balls out because it spits one ball and then the next ball out. Dave - That would be another way of looking at it. Physics can be looked at in different ways! Previous Why is it that some smells disappear with continued smelling? Next Does a drop of water contain one molecule per litre of water on Earth? How do we store solar and wind energy?